So it’s happening. Really happening. 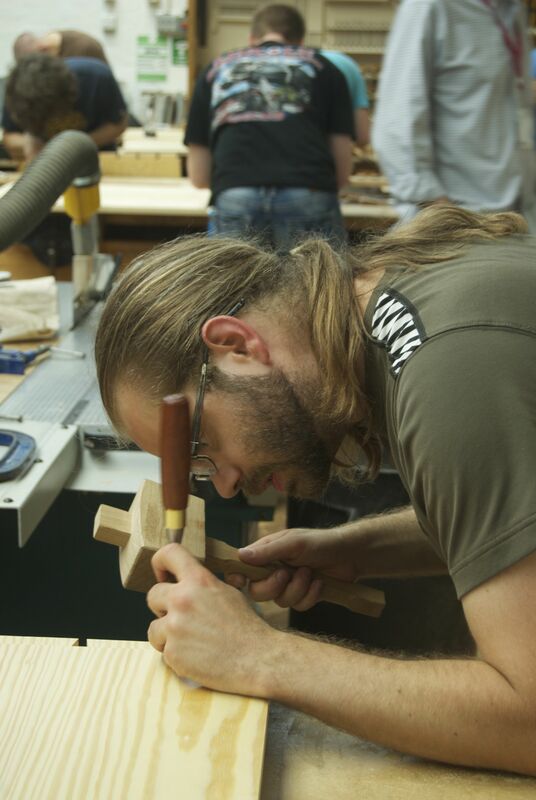 Today was the first day of the Anarchist’s Tool Chest course with Chris Schwarz. And so far it has been a real blast; hard work and a fast paced course, but so much fun. So. Much. 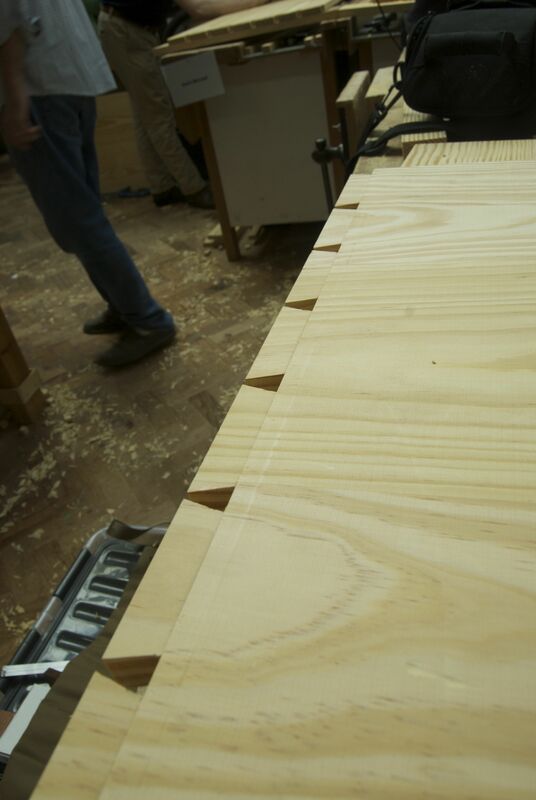 The order of the day has been dovetailing (I knew those practice joints would come in handy). 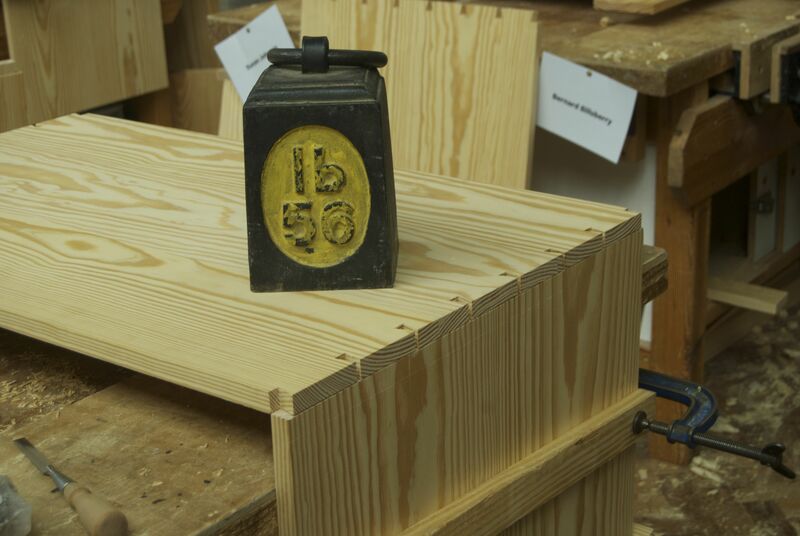 The yellow pine stock for our tool chests had already been processed by the students at Warwick College, so all the panels were glued up, squared off, and ready for joining. So, after a quick reenactment of an iconic scene from Full Metal Jacket (“This is my dovetail saw, there are many like it but this one is mine…”) we dove right into rabbeting the tail boards and cutting the tails on the front and back panels (7 a-side, so 28 in total which was made swifter work by gang-cutting the tails). A quick stop for lunch, and then back to chopping out the waste, paring and working up the first of the pin boards. All accompanied by in depth demonstrations and explanations by Chris on both the operations at hand, as well as a crash course in sharpening (featuring the now legendary Lie Neilsen sharpening jig, which is as lovely as the internet rumours would have you believe). No course would be complete without a trip to the pub for refreshing beer, huge burgers, and good chat. Tomorrow we will cut the other pin boards and start to assemble the carcass. And I will update on the day’s progress tomorrow evening. But for now, I leave you with some pictures of today’s work. Cutting the tail board – 7 tails per side, on what is the largest board I’ve worked to date (2′ high and 4′ wide). Luthier (great chap, and very dear friend) Mikey Royce chopping waste from between his tails. The best way to avoid your tail board shifting when laying out the pins? Large weights, apparently. I’m hoping that after we’ve finished building the Anarchist’s Tool Chest we can all do some Anarchist’s Kettle Bells. Thank you for sharing this experience on your Blog Kieran! Did you partake in any of the post class festivities? I may have stuck around for some post workshop beer and chat, yes Chris. I was (predictably) excited to learn that Mr Schwarz shares my love of 90’s insurgent country (Whiskeytown, Ryan Adams, Uncle Tupelo) and early R.E.M. Good times indeed.